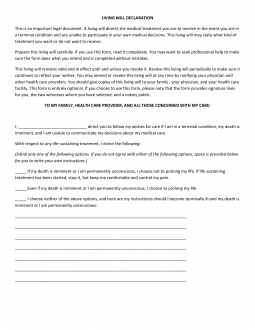 The South Dakota living will declaration is a legal document that allows a one to make their own decisions with regard to how they would like to have their medical treatment directed and honored when they reach the end of their life and are no longer able to make decisions on their own. If you are uncertain as to how this document works, you may wish to consult with a qualified attorney. This document may be revoked at any time as long as the declarant is competent to do so. Medical Power of Attorney – A form that gives representation rights over a person for the handling of their health care decisions if the patient is not able. Step 4 – Notarization – As the notary has witnessed all signatures, he/she will complete the remainder of the document and authenticate with the state seal.